In large bowl, beat cream cheese and sugar with electric mixer on medium speed until fluffy. Add egg yolk and vanilla; beat on low speed until blended. Unroll 1 can of dough into 1 large rectangle; press seams and perforations to seal. Press onto bottom of ungreased 13x9-inch (3-quart) glass baking dish. Spread with cream cheese mixture. In small bowl, mix pecans, brown sugar, butter and cinnamon. 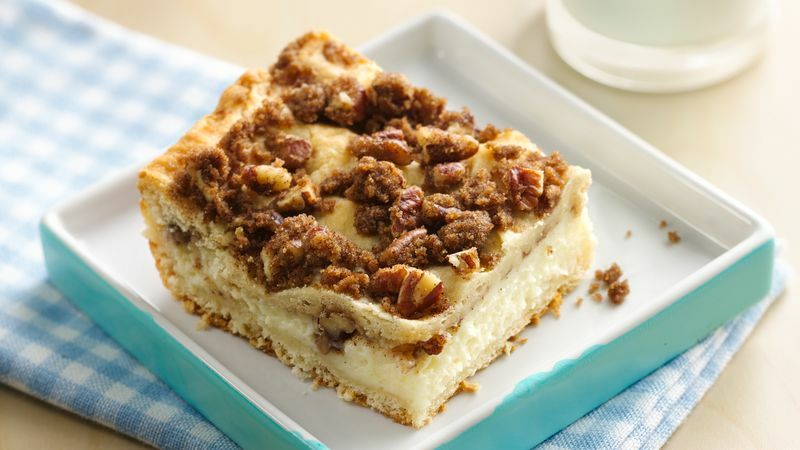 Sprinkle half the pecan mixture over the cream cheese layer. On lightly floured surface, press or roll out remaining dough into 13x9-inch rectangle. Place over filling. Sprinkle remaining pecan mixture over top. Bake at 375°F 20 to 25 minutes or until golden brown. Cool slightly on cooling rack. Sprinkle with powdered sugar. Cover and refrigerate leftovers.